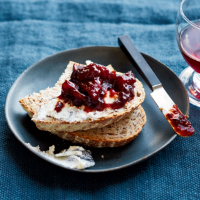 Making your own chutney is really easy and a great way of using seasonal ingredients. Finely grate the zest of the lemon into a preserving pan then add the juice. Peel and core the pears and apples. Chop or slice them, and do the same to the onions and peppers. Toss both fruit and vegetables in the lemon juice in the pan. Mix the dates and all the remaining ingredients together in the preserving pan and warm over a medium heat until the sugar has dissolved. Cook, uncovered, for about 35-40 minutes, or until reduced to a thick pulp, stirring occasionally. While the chutney is cooking, sterilise the jars. Preheat the oven to 160°C, gas mark 3. Thoroughly wash 3 preserving jars and dry upside down in the oven for 30 minutes. Pour the thickened chutney into the warm jars. Seal with vinegar-proof lids and label. Keep for up to 3 months. Once opened, keep in the fridge and use within 1 month. Great with strong cheeses and cold meats, or to accompany cheese on toast.